Photo: Almigdad Mojalli/IRIN. 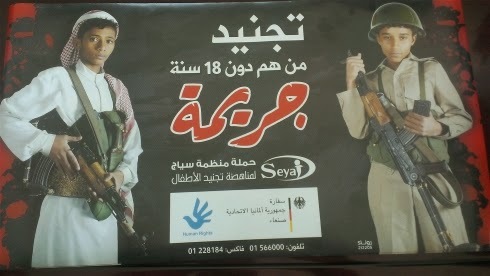 A poster from the Seyaj NGO reads: "Recruitment of children under the age of 18 is a crime". SANAA, 18 February 2015 (IRIN) - The coming to power of northern rebels in Yemen could derail moves to end the use of child soldiers in the country.